On their third try, the Browns finally figured out how to win in overtime. CLEVELAND (AP) — Once Baker Mayfield summoned the courage, the rookie quarterback looked in time to see Greg Joseph’s low, line-drive kick somehow go through the uprights. Mayfield’s mouth opened in disbelief. And in this unpredictable NFL season, Cleveland’s rapid rise may be the strangest twist of them all. Joseph’s 37-yard field goal — a knuckleball the rookie was certain had been blocked — with 2 seconds left in overtime gave Cleveland a 12-9 win over the Baltimore Ravens on Sunday. 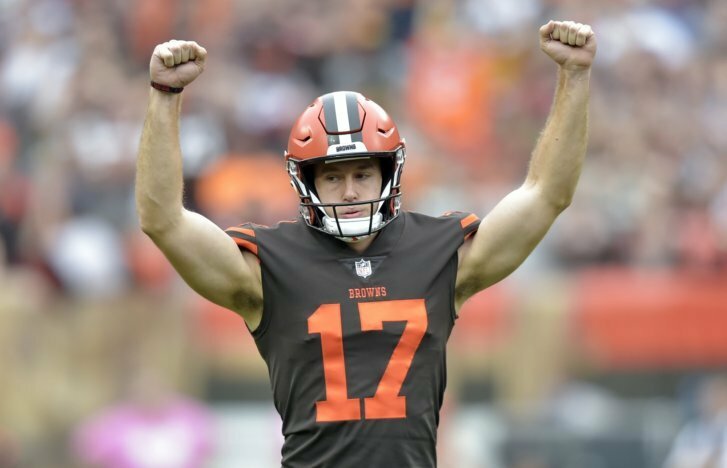 After Mayfield made a clutch third-down throw to help drive the Browns (2-2-1) into position, Joseph, who was cut by Miami this summer and signed after Week 2 following Zane Gonzalez’s release, came through to give Cleveland its first AFC North win in 19 tries. Believe it or not, the Browns are legit. They’ve played three overtime games in five weeks, and if not for some missed kicks in New Orleans and questionable call last week in Oakland, Cleveland could be unbeaten. When the final kick sailed through, Browns fans celebrated just the team’s second win in two seasons and Joseph, who missed an extra point in the first half, was mobbed by his teammates. It was vindication for Joseph, who also missed a 55-yarder at the end of regulation. The Ravens (3-2) had plenty of chances, but Joe Flacco threw a costly interception in the first half and the Browns blocked one of Justin Tucker’s field goal tries. In his first start at home, Mayfield threw a 19-yard TD pass to Rashard Higgins, but his biggest play was a 39-yard completion to rookie Derrick Willies on Cleveland’s winning drive. “Baker just makes plays, man, and he knows what to do in tough situations,” Browns guard Joel Bitonio said. The Ravens, who got another strong effort from their defense, also had a chance to win it in the final minute of regulation, but wide receiver Michael Crabtree couldn’t hold onto Flacco’s pass in the back of the end zone. Tucker then tied it with a 32-yard field goal with 52 seconds left. On their third possession of OT, the Browns started at their own 5-yard line and were at their 18 facing a third down when Mayfield zipped a pass over the middle to Willies, who didn’t have any catches coming in and was playing after Higgins went out with a knee injury. Duke Johnson ripped off a 15-yard run and had two more short carries before the Browns sent in Joseph, a college walk-on who was released by the Dolphins after training camp but got a another chance after Gonzalez missed four kicks in a Week 2 loss at New Orleans. Cleveland’s win was also the Browns’ first in 37 tries on a Sunday, and it gave Jackson his first victory inside the division in three seasons. Flacco finished 29 of 56 for 298 yards and one interception, but Baltimore’s offense struggled to get into a rhythm all day. Browns rookie cornerback Denzel Ward continues to dazzle. The No. 4 overall draft pick intercepted Flacco i n the first half and then blocked Tucker’s 48-yard attempt on the final play of the first half. Ward has three interceptions this season, and he’s impressed his teammates with his toughness. Browns: Jackson said Higgins will undergo an MRI on Monday. He had three catches for 66 yards and the TD before going out. Cleveland’s defense was solid last season, but didn’t force enough mistakes. That’s changed as the Browns now lead the league with 15 takeaways after recording 13 all last season. Cleveland was called for 10 penalties, while Baltimore was only whistled for four, and one of them came in overtime and wiped out a big run by Alex Collins. Ravens: At Tennessee on Oct. 14. Browns: Host the Los Angeles Chargers on Oct. 14.